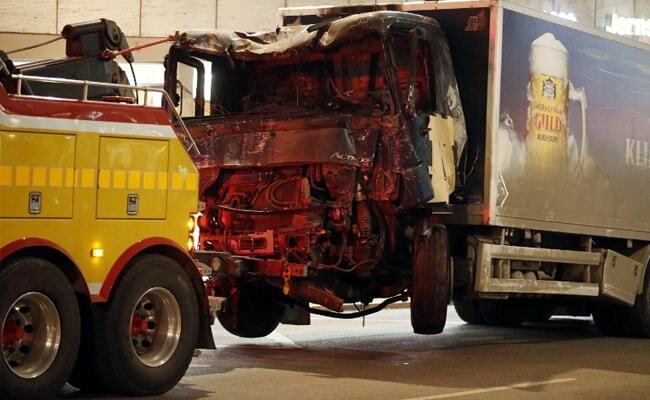 Stockholm Terror Attack: Bloody tyre tracks showed the path of the truck, stolen by a masked hijacker. Swedish PM Stefan Lofven described the incident as a "terror attack"
A truck ploughed into a crowd on a shopping street and crashed into a department store in central Stockholm on Friday, killing four people and wounding 15 in what the prime minister said appeared to be a terrorist attack. Swedish prosecutors said a man detained in connection with a truck attack in the capital had been arrested on the strongest degree of suspicion of committing a terror crime. Sweden's legal system has several degrees regarding the strength of suspicion. "One person has been arrested on suspicion of terrorist crimes through murder," Karin Rosander, press spokesperson at the prosecutors office told Reuters. Swedish public broadcaster SVT reported police had arrested a second man and that he had a connection to the previously arrested person, citing police sources. The police declined to comment on whether it had arrested any additional suspects. "Our message will always be clear: you will not defeat us, you will not govern our lives, you will never, ever win," Prime Minister Stefan Lofven, who had earlier described the assault as a terrorist attack, told a news conference. 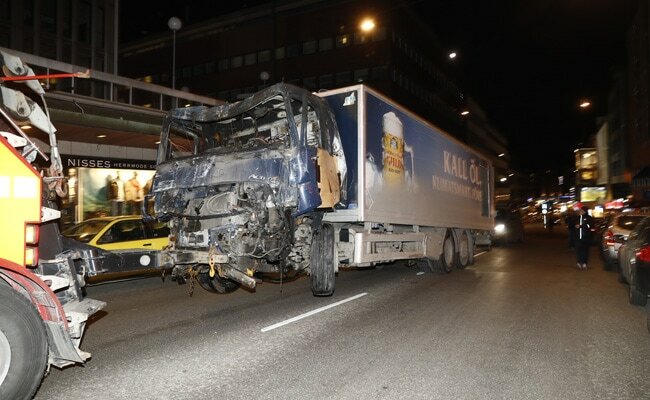 The stolen truck, which was driven through a crowd outside a department in Stockholm on April 7. "I turned around and saw a big truck coming towards me. It swerved from side to side. It didn't look out of control. It was trying to hit people," Glen Foran, an Australian tourist in his 40s, told Reuters. "It hit people; it was terrible. It hit a pram with a kid in it, demolished it," he said. "Then it drove into a pillar at (department store) Ahlens City, where the hood started burning. When it stopped we saw a man lying under the tyre. It was terrible to see," said the man, who saw the incident from his car. ISIS claimed responsibility for an attack in Nice, France, last July, when a truck killed 86 people celebrating Bastille Day, and one in Berlin in December, when a truck smashed through a Christmas market, killing 12 people. "Hijacking a truck, that has happened before," Magnus Ranstorp, head of terrorism research at the Swedish Defence University, told Reuters. "And this is a pretty cunning modus operandi. To drive to Ahlens and stop ... There is a way down to the subway just a few metres away from there, and then you ... can jump on any train you want and quickly disappear." "Our thoughts are going out to those that were affected, and to their families," Sweden's King Carl Gustaf said in a statement, while European Union chief executive Jean-Claude Juncker said an attack on any of the bloc's member states "is an attack on us all". 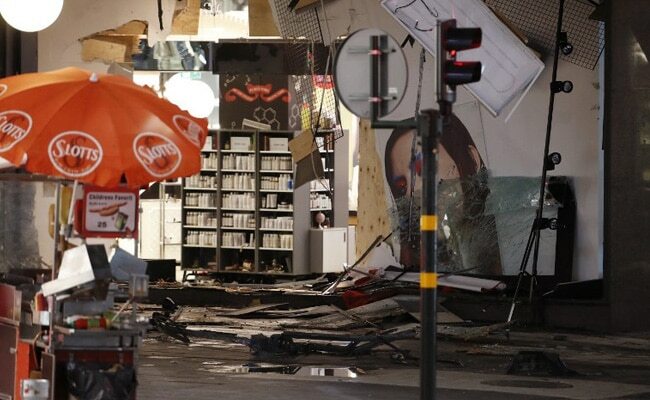 Sweden has not seen a large-scale attack, although in December 2010 a failed suicide bombing killed the attacker only a few hundred yards from the site of Friday's incident. In February US President Donald Trump falsely suggested there had been an immigration-related security incident in Sweden, to the bafflement of Swedes. Swedish authorities raised the national security threat level to four on a scale of five in October 2010 but lowered the level to three, indicating a "raised threat", in March 2016. Police in Norway's largest cities and at Oslo airport will carry weapons until further notice following the attack. Denmark has been on high alert since the February 2015 shootings. Traffic was restricted on the Oresund Bridge linking Denmark and Sweden at the request of Swedish police. The Sapo security police said in its annual report it was impossible to say how big a risk there was that Sweden would be targeted like other European cities, but that, if so "it is most likely that it would be undertaken by a lone attacker".